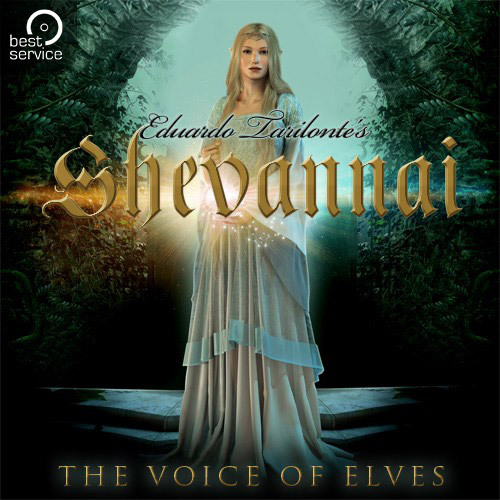 Shevannai Voice of Elves by Best Service is a Virtual Instrument Audio Plugin and Soundware (e.g. samples or presets that load into other products). It includes, and is therefore "powered by", Kontakt Player, which functions as a VST Plugin, an Audio Units Plugin and an AAX Plugin. 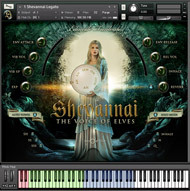 Shevannai is a tool for composers and sound designers to create ambience and music for films, documentaries, video games and new age music. Shevannai is a unique solo vocal library aimed at easily creating your own ultra-realistic melodies, without using any phrases. Thanks to over 4000 carefully recorded and wisely programmed samples by Eduardo Tarilonte (Forest Kingdom, Epic World, Desert Winds, Era Medieval Legends and more), handling the 5 true legato types and 33 words, is intuitively easy. 5 different true legatos (a, e, i, o, u). 27 staccatos (16 short and 11 long). 113 phrases in different keys (A, Bb, C, D, E, Eb, F and G). 52 phrases in Elven Language reciting some Elven poems. 57 whispered phrases in Elven Language reciting some Elven poems. 110 different whispers. Divided in long and short whispers. 20 beautiful and inspiring soundscapes. The Voice: Legato, Staccato and Inhale patches. Phrases: Over 100 phrases in different keys (A, Bb, C, D, E, Eb, F and G) and whispers. Soundscapes: 20 beautiful and inspiring soundscapes. One of the most important features of this library is that the voice has been recorded without vibrato. Singing non vibrato requires a very experienced singer and a lot of effort to obtain a true ethereal feeling. Of course you may add vibrato at any time. 4,409 unique samples (mono, 44 kHz, 24-bits) 3,60 GB. Including Native Instruments Kontakt Player 5. Shevannai is available as download or DVD version at www.bestservice.de as well as at Best Service's key dealers.